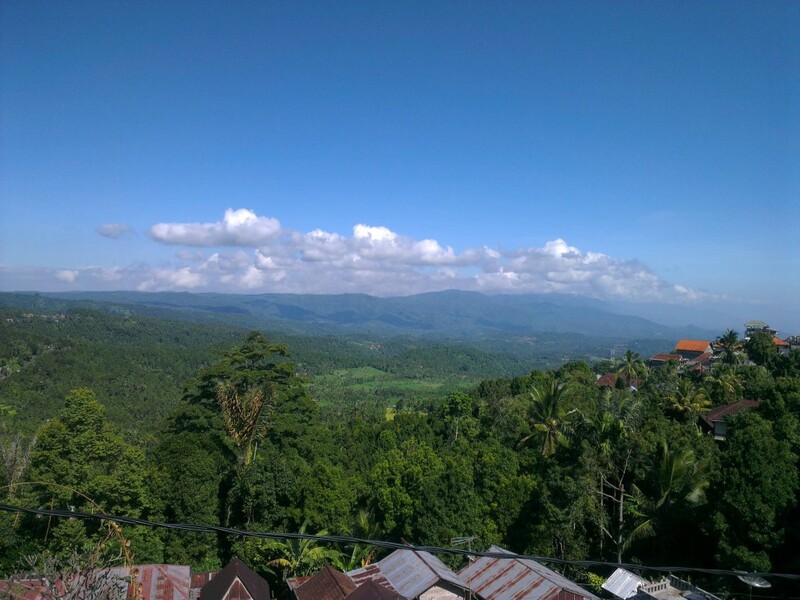 Escape the busy tourist areas of Bali and head north to Munduk for a breath of fresh air. Munduk is a remote inland village surrounded by cool forest-covered hills, acres of rice fields and peaceful waterfalls. Every evening you’ll be greeted by an incredible sunset. It’s the perfect place to relax and appreciate the nature around you. Like us, you may arrive for a couple of days but end up staying for a week, during our two month tour of Bali. 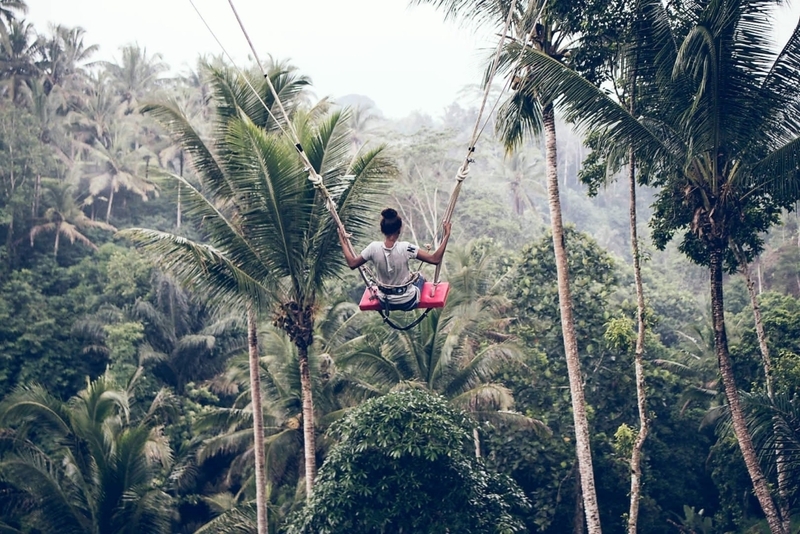 Read on to discover five wonderful things to do in Munduk, Bali. On our first day, when we were wondering what to do in Munduk, our guest house owner gave us a rudimentary map and advised us explore the local scenery. Take a walk away from Munduk’s main road and you’ll quickly find yourself among the calming rice terraces. 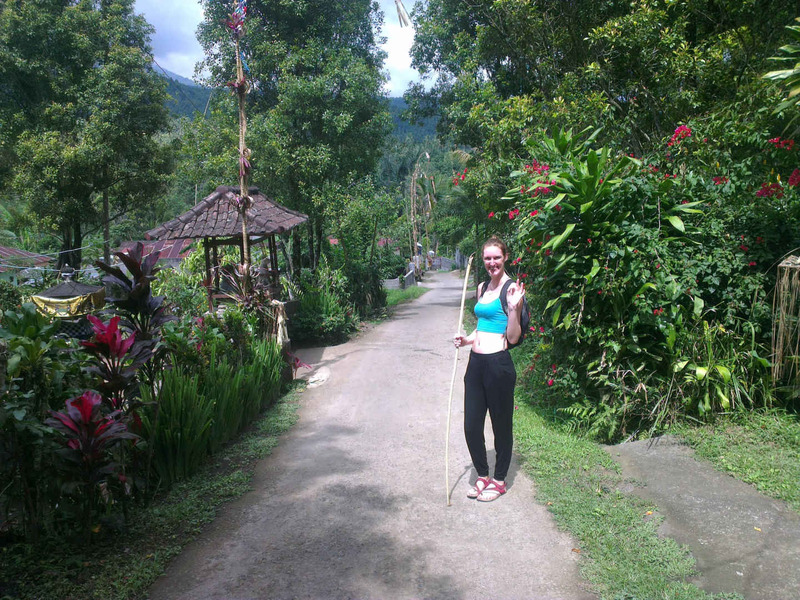 We grabbed a couple of long bamboo sticks we found on the forest floor to use as walking sticks, as the paved roads turned into muddy tracks and we headed into the jungle. 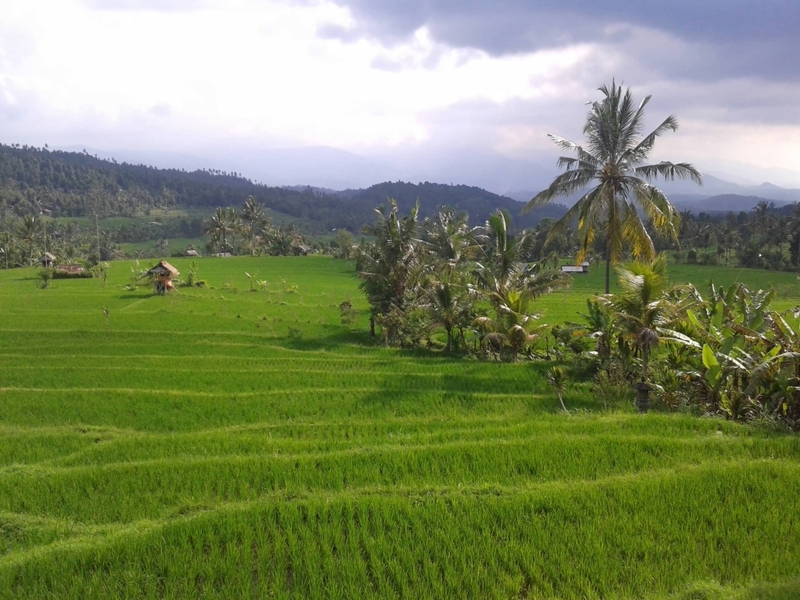 Explore this gorgeous green landscape is really the best way to see Munduk and get to know Bali. The best time to start your trek is in the morning, as the afternoons can get cloudy. Trekking through the trees, you will walk along narrow muddy paths and there are not always signs to point the way. Getting off the beaten track can be really rewarding, as you lose yourself in the wilderness and then find your way back to familiar territory. After your hiking activity, rejuvenate your body with a massage at O’O Massage in Munduk village. Here, you can choose from a range of body treatments to soothe tired muscles and make sure you’re raring to go again the next morning. 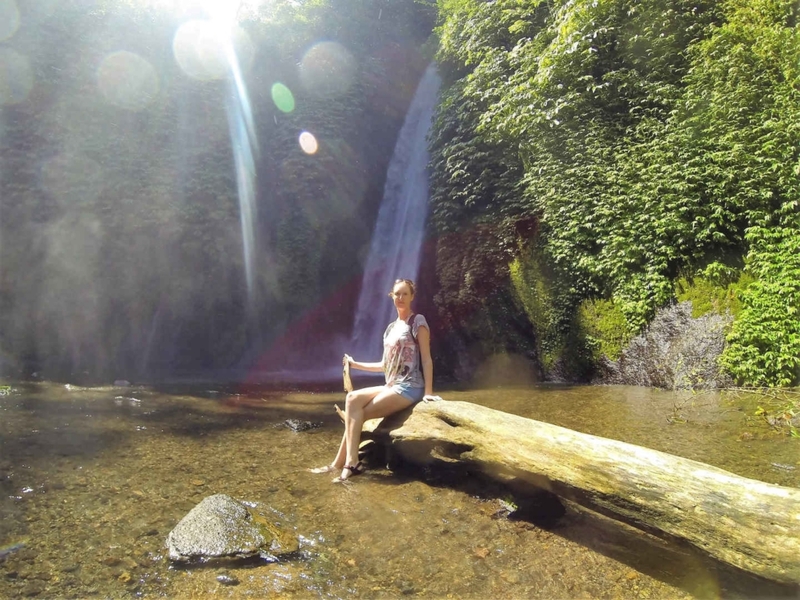 The hills and slopes of Munduk are the best place on Bali to go waterfall hunting. Here, you will feel like you are really getting to know the island’s natural beauty. If, like us, your guest house owner gives you a Munduk waterfall map, you can look forward to a day of adventure as you track them down. Even the winding trails on the way are attractive, dotted with exotic plants. They can be steep, so it’s best to wear hiking sandals. Sometimes, if we passed a local person, we would ask them for directions to make sure we were on the correct path, and they were always happy to help. There are a number of waterfalls in the area, some of which have small entrance fees to enter. The cost is usually around 10,000Rp to 20,000Rp (about a dollar or two) for each person to enter. Once you arrive at each waterfall, you are rewarded with a cool and refreshing stop from the heat of the day. If you don’t have a map, you can find the waterfall locations marked on Google Maps. Search for Air Terjun Munduk, Laangan Waterfall, Labuhan Kebo Waterfalls, Red Coral waterfall, Melanting waterfall, Golden Valley Waterfalls, Gobleg Waterfall and Munduk Waterfalls Trekking Point. Hiking through the jungle to explore the waterfalls can be hot and tiring, so make sure you bring water and snacks, though you may find small cafes and shops along the way. 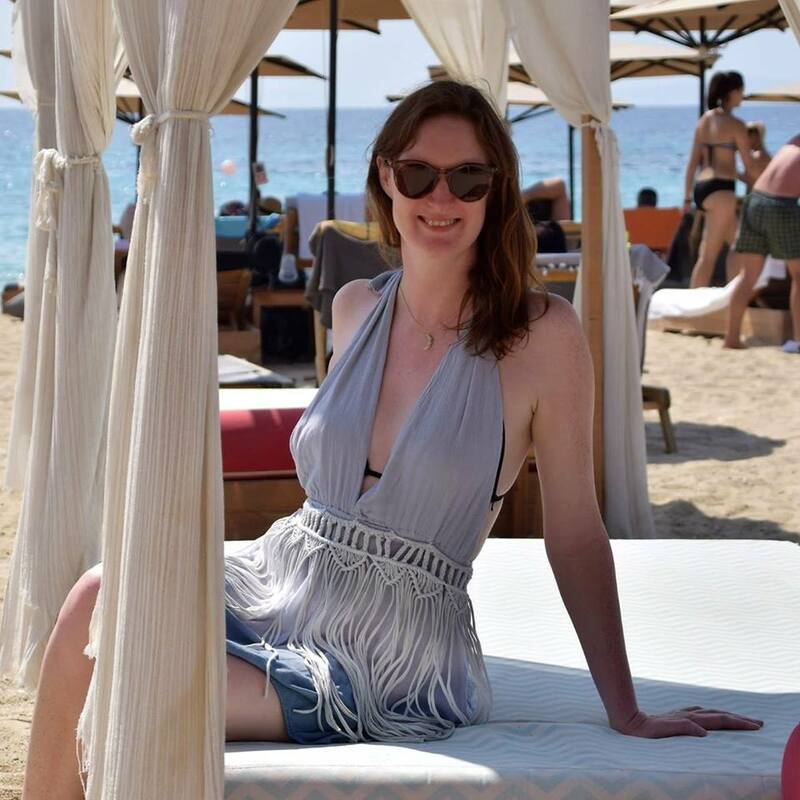 It could take two or three hours, so I would advise bringing a backpack with a sarong or long sleeved top and sunscreen. Also, bring an umbrella or waterproofs, as we got caught in a heavy rainstorm and had to take shelter! Once you find each waterfall you can take a dip, so you may want to bring a swimsuit and towel. Sometimes you may have the place almost to yourself. If you have a car or bike, you can reach Bali waterfalls a bit further afield, such as Gitgit waterfall, Sekumpul falls and Nung Nung waterfall. 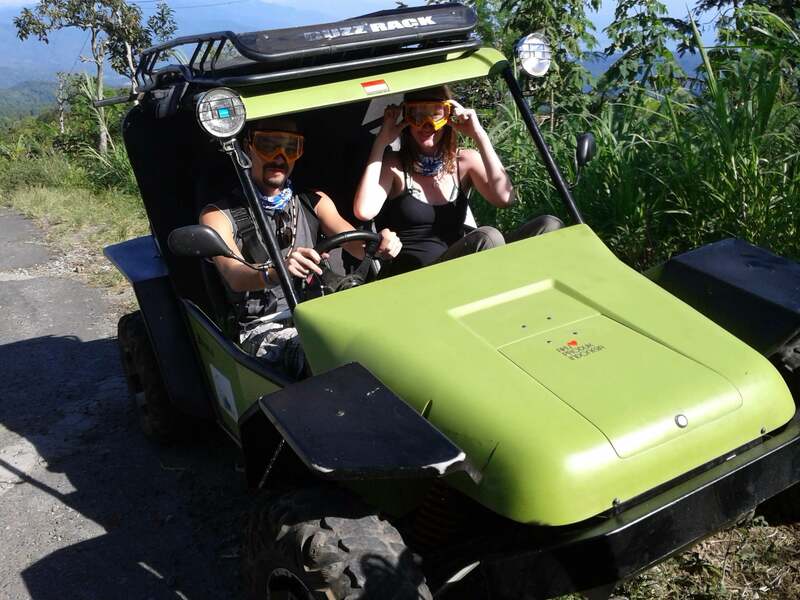 We’d read great reviews about a Bali adventure tour company called Munduk Wilderness. Their guides take guests on a journey deep into the area’s rough terrain by mountain bike and an unconventional locally-built off-road vehicle called a Fin Komodo. These tours open up the island even more, as you can reach otherwise inaccessible places. As we kitted up and set off in our Fin Komodo, our guides showed us the region’s clove, cocoa, and coffee plantations and explained how these crops are processed. This was followed by a mountain bike ride along rough roads, deep into the Balinese countryside, which opened up stunning views that we wouldn’t have seen otherwise. Along the way, we stopped at the island’s only Buddhist monastery, a natural spa where we rested our weary muscles in the hot springs and even more spectacular views of rolling rice fields. At the end of the day, back at base camp, we tucked into a delicious meal and a well-earned local Bintang beer. This was definitely a highlight of our time in Bali and you can read the full blog post about it here. Within a half hour drive of Munduk, you can find some amazing sights. 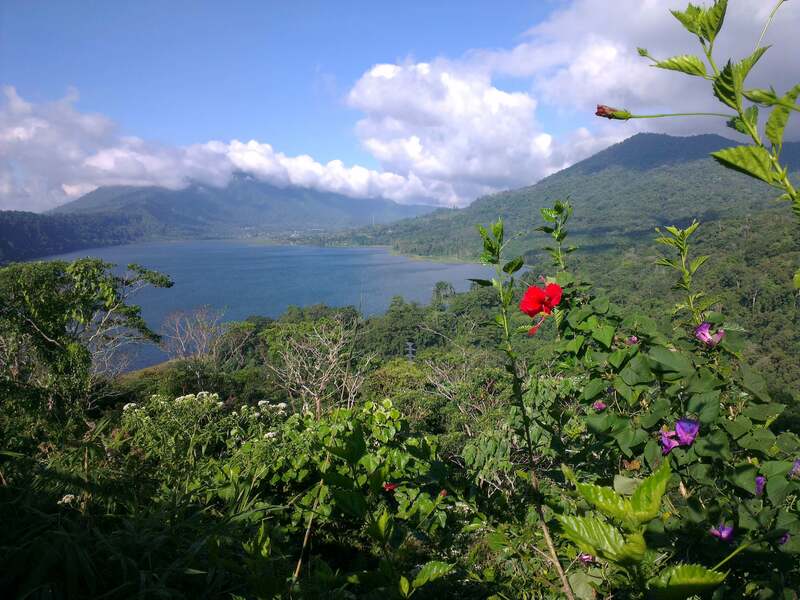 You’ll pass three scenic lakes –Danau Tambligan, Danau Buyan and Danau Beratan – where there are plenty of wonderful viewpoints and even one of the famous Bali swings. Search for ‘Twin Lake Wanagiri spot’, ‘Pucak swing and agro tourism’ and ‘Hidden Hills Wanagiri’ in Google Maps for photo opportunities to your heart’s content. 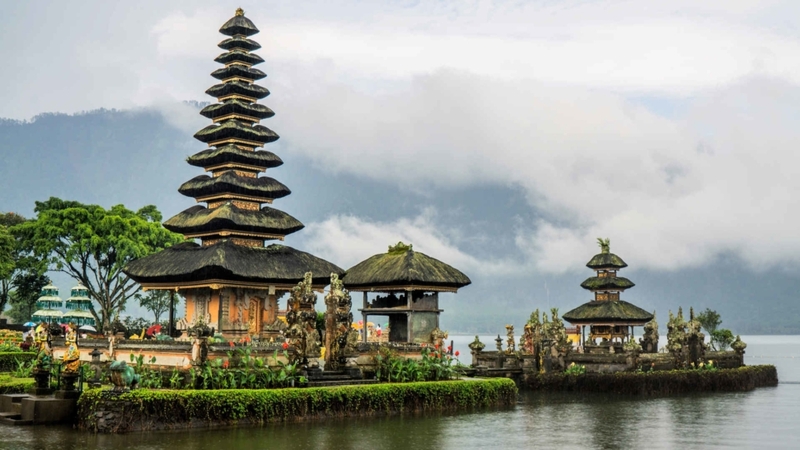 Sitting on Lake Beratan, 30 minutes’ drive from Munduk, is one of Bali’s most famous and picturesque temples, Pura Ulun Danu Bratan. Mirrored in the lake’s still waters, this iconic temple, built in 1633, appears to be floating in front of the mountain backdrop. Here, locals make offerings to the water goddess, Dewi Danu. You can take a photo of the temple from the lake’s shores or rent a boat to enter and explore its manicured grounds, which costs around 50,000Rp per person (around US$3-4). It’s best to visit in the morning for fewer crowds and clear skies. 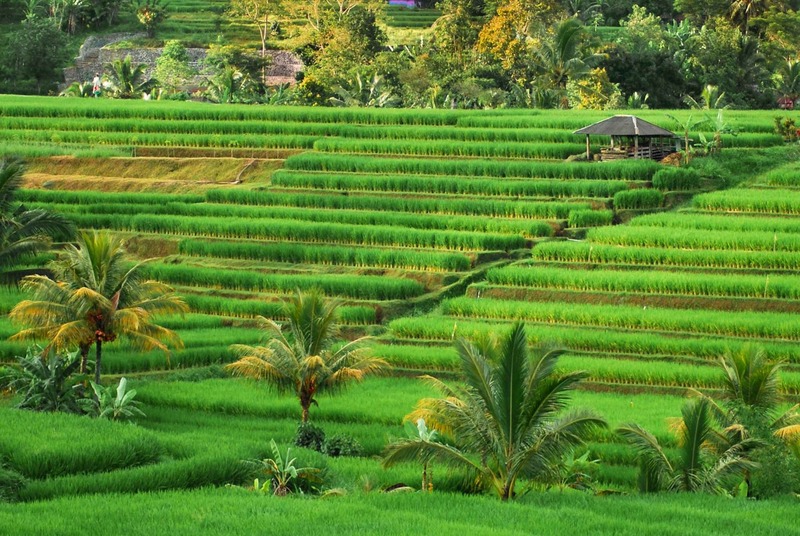 Just over an hour by car or motorbike from Munduk, halfway to Ubud, are the famous Jatiluwih rice terraces. This UNESCO World Heritage Site has steep, vivid green terraces as far as the eye can see, with trails allowing you to explore the area on foot. The 2,276-metre high Bratan volcano looms in the background providing a truly incredible landscape. You can organise a driver or tour guide from Munduk to take you here for a day trip, along with waterfalls and other attractions, which should cost you around 500,000Rp (US$40) in total. Half an hour’s drive east of Munduk village, close to Pura Ulun Danu Bratan, is the Handara Golf & Resort Bali. Many people come here who are not remotely interested in playing golf. Why? Because the gates on the road leading up to this golf course are made with beautiful Balinese stone-masonry and they frame the mountain behind perfectly. It’s a popular spot for photos. These days, to take a shot here costs around 30,000Rp (just over US$2). Try to avoid coming here at midday when the sun is right overhead. The light is most beautiful at sunrise or in the afternoon, after your morning visit to the temples or waterfalls. 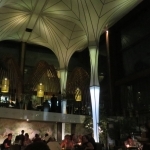 As with all of Bali, eating and drinking is one of the most enjoyable things to do in Munduk. You can tuck into tasty Balinese dishes at casual restaurants and cafes that have unbelievable views across the hills and forests. 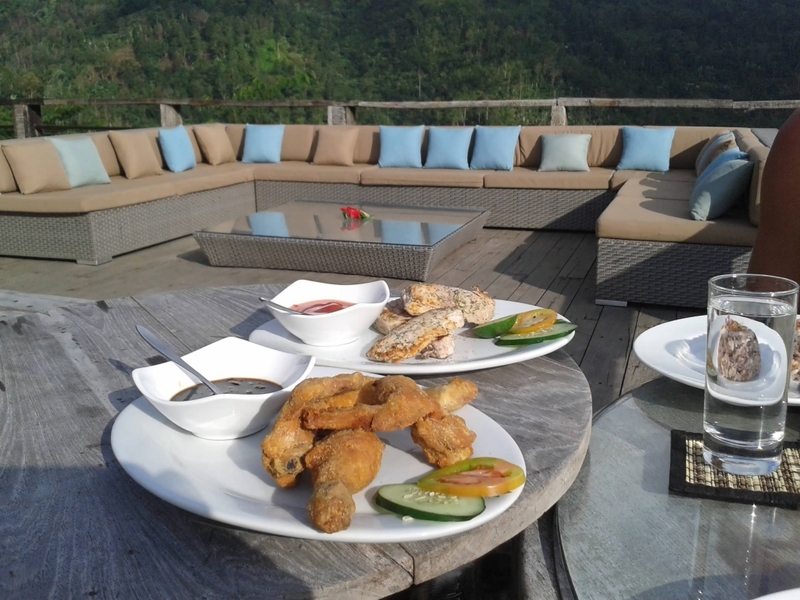 Head for Eco Café Munduk for food with a view, which also supports local farmers and coffee producers. 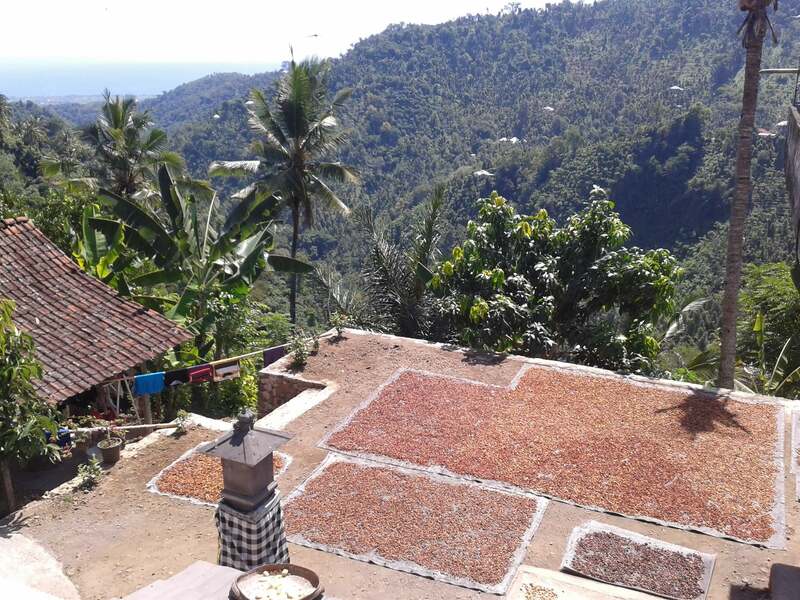 There are numerous Munduk coffee plantations on the area’s cool mountain slopes, producing what’s said to be the best coffee in Bali. It’s the perfect excuse to take a pit stop and refuel with a cup of locally produced coffee. Taste the organic coffee and learn how it’s harvested and roasted at Munduk Moding Plantation Nature Resort & Spa, which also supports the local community and environment. Bali is known for its speciality coffees, flavoured with everything from vanilla to ginseng, which are all delicious and definitely worth a try. 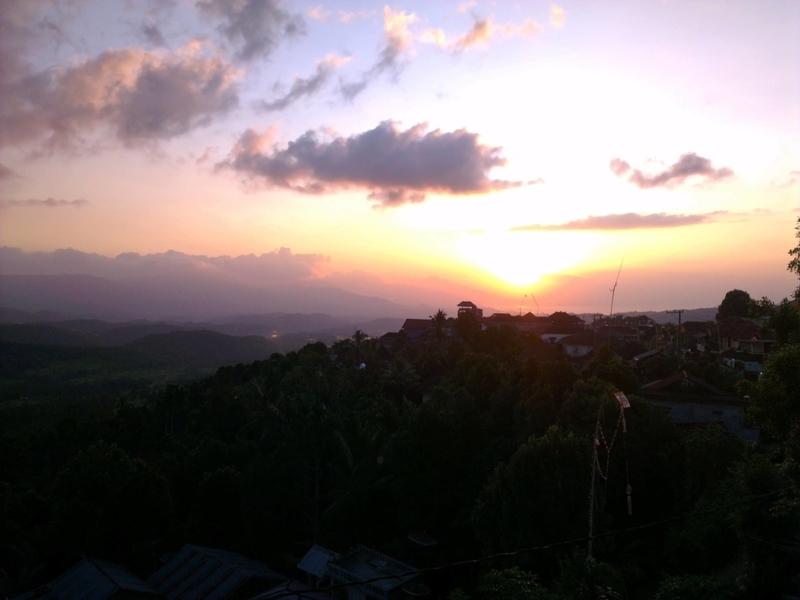 In Munduk, you will see stunning sunsets every day. One of the best simple pleasures here is to leisurely eat dinner at a Munduk restaurant, as you watch the oranges and reds pass across the sky. Try the pork rendang at the laid back Warung Heaven Munduk or head to Warung Classic for perfect sunset views. Bring close to the centre of the island, Munduk is relatively easy to reach from most places. From Ubud to Munduk it’s a distance of around 40 miles (64 km), which takes about an hour and forty minutes by car or scooter. From the international airport in Denpasar to Munduk the journey takes around two hours, depending on traffic. If you’re looking for Munduk accommodation, there are several charming guesthouses and hotels, many of which have their own restaurants and are positioned to take advantage of the area’s naturally beautiful scenery. Munduk’s guesthouses offer incredible value for money. We stayed at Aditya Homestay, which we would highly recommend. The family that runs this Munduk guesthouse are so warm and kind, we ended up staying for longer than planned. We stayed in a corner room with floor to ceiling windows overlooking these magnificent valleys. Every morning, the staff would serve us a freshly prepared breakfast on our balcony as we sat and took in the surroundings. The rooftop restaurant was ideal for romantic sunset dinners. It was one of the favourite places that we stayed in Bali. Another great guesthouse option is One Homestay Munduk. Visitors rave about the mountain views from all of its rooms, as well as the home-cooked food in the on-site warung. 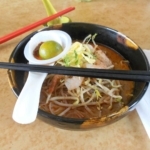 On request, the staff can provide cooking classes and tour packages. For something more mid-range, try a Munduk eco-hotel such as Puri Lumbung Cottages. Here you can stay in a converted from rice barn that has been lovingly recreated as a traditional, rustic cottage or villa, with open-air bathrooms and the irresistible mountain views. There’s also an on-site restaurant, spa and yoga and meditation centre. If yoga is your thing, you could also try Yoga Village Above The Clouds in nearby Bedugul. This secluded resort with views of the rice terraces offers free morning yoga classes. The top luxury hotel in Munduk is the Moding Plantation Nature Resort & Spa, which has an on-site spa, coffee plantation (as mentioned earlier), and a hot tub and infinity pool where you can truly relax among these incredible mountainous surroundings. Its suites and villas are furnished with hardwood floors and marble bathrooms, and kitted out with iPod docks and flat-screen TVs. Some villas have their own private pools and even offer butler service. Now that’s luxurious. I hope this has helped you to get a taste for Munduk and hopefully you will fall in love with it as much as we did. Next up, discover more about Bali backpacking and the amazing activities across the island, here.